Pssst I've written this out for the Ladies sizing ... but you can definitely use it for the girls sizing options as well. 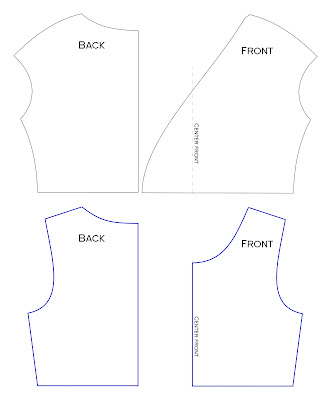 This can also be used on the Easy Cap-Sleeve Tee pattern. 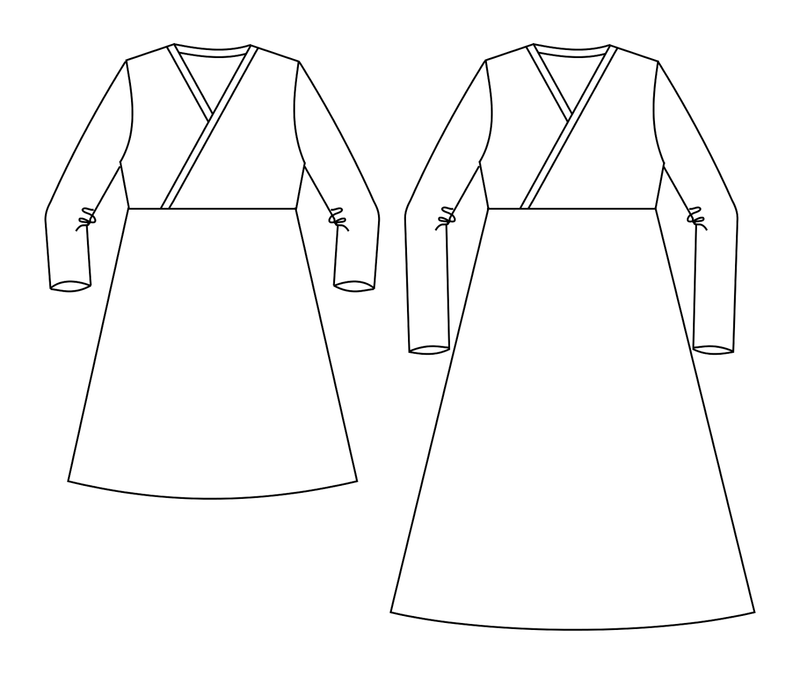 [Below] To start out, you'll need the Front and Back pattern pieces for the bodice from the Crossover Tunic and Dress Pattern [top with black lines] and the Front and Back pattern pieces for the bodice from the Basic Empire Bodice [bottom with blue lines] (available in the Mix&Match Series). 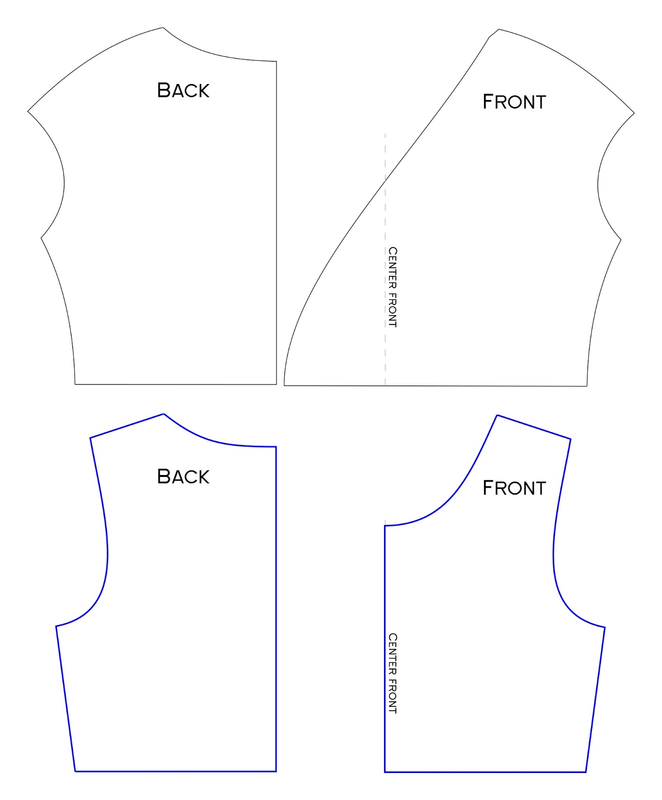 [Below] Lay the Basic Empire Bodice pattern pieces on TOP of the Crossover Tunic pattern pieces. Align the center front/center back, the empire lines and the side seam at the bottom. 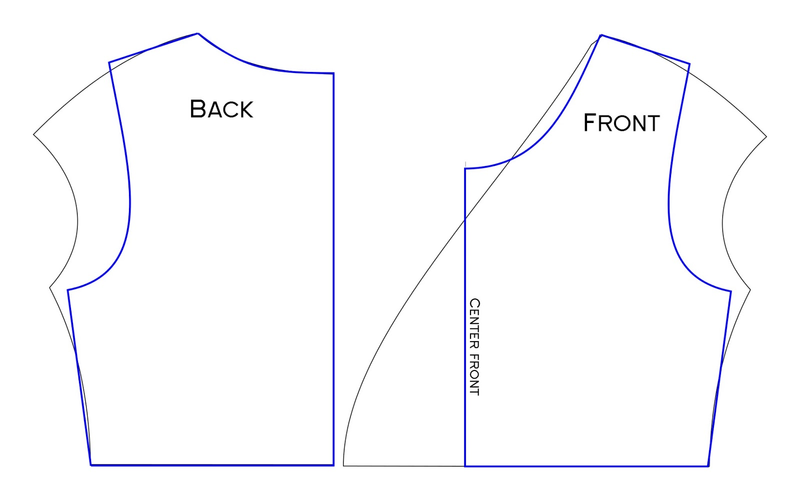 NOTE: The side seam at the armpit on Basic Empire Bodice will be LESS than the side seam at the armpit on the Crossover Tunic. 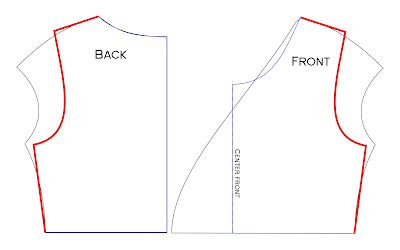 The shoulder seam on the Basic Empire Bodice will be HIGHER than the shoulder seam on the Crossover Tunic. 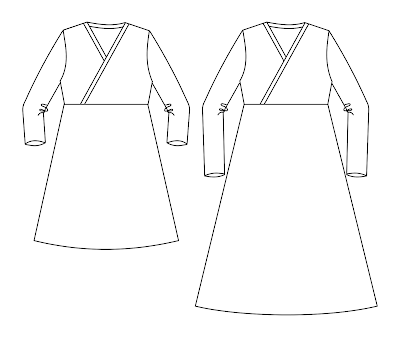 [Below] The RED lines show the NEW lines you'll trace onto your Crossover Tunic pattern using the Basic Empire Bodice as your guide. 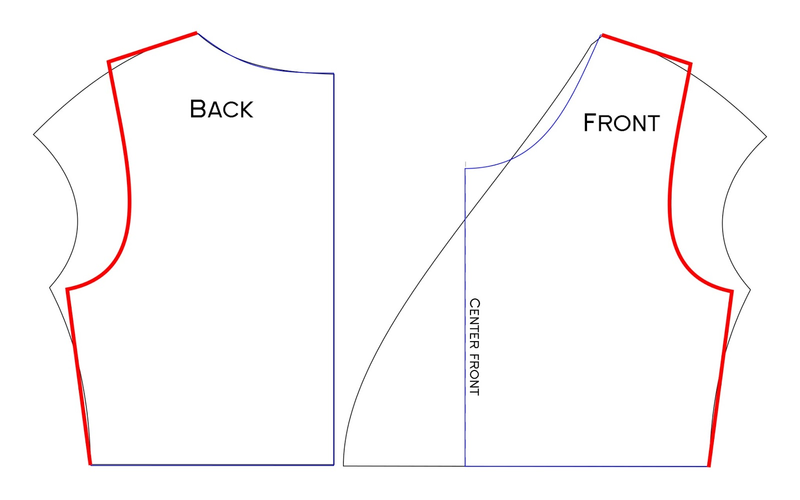 NOTE: The side seam at the armpit on Basic Empire Bodice will be LESS than the side seam at the armpit on the Crossover Tunic. 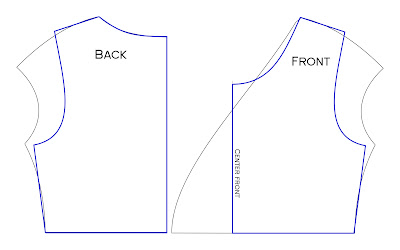 The shoulder seam on the Basic Empire Bodice will be HIGHER than the shoulder seam on the Crossover Tunic -- if you already cut out your Crossover patter you might need to tape some paper along the shoulder seams to draw the NEW lines. D-O-N-E ... now you can pair your Crossover Tunic or Dress pattern with ANY of the sleeve options available in the Mix&Match Series. 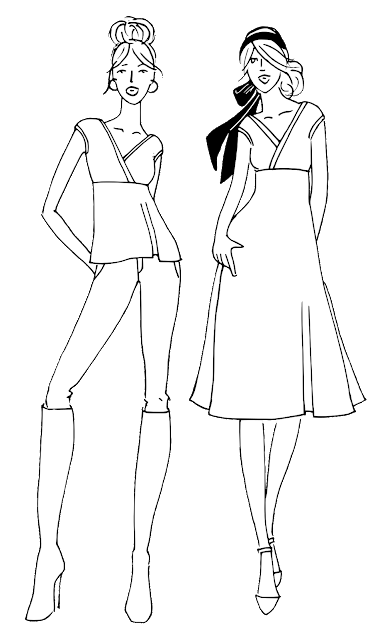 [Below] Drawing of the Crossover Tunic with 3/4 Sleeves [left] and the Crossover Dress with Long Sleeves [right]. I HIGHLY recommend using the Classic Sleeve option. It includes SIX different lengths: cap, short, elbow, 3/4, wrist and long sleeves.